Having pimples can take you back to your teenage days. So, why do we get pimples on arms in our adulthood? There are several internal and external factors that contribute to these annoying bumps. The location of the acne usually determines the underlying cause. 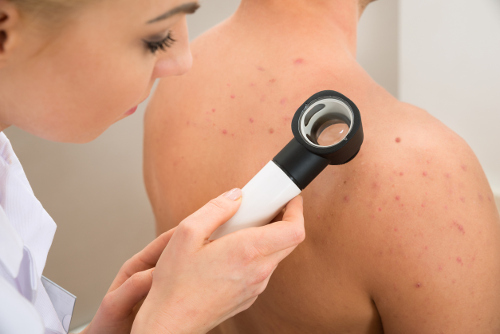 With pimples developing on the arms, particularly the back of the arms, there can be varying causes. We will look at acne on arms and learn simple home remedies to treat the pimples. If you battle acne issues, be assured that it is a common and natural part of life. More than 70% of Americans face this skin condition in their lifetime. While acne is more often associated with the face, pimples on arm are also common, as are acne breakouts on the back, inner thighs, and legs. What Causes Pimples on Arms? Before treating the acne, we need to know the common pimples on arms causes. Some cases are caused by hereditary conditions such as keratosis pilaris, while other cases may be traced to a deficiency in vitamin D or hormonal imbalance. Except during pregnancy, acne is more prevalent in males than in females. Most pimples on arm cases are caused by excessively dry skin. We have a tendency to neglect the upper arms, and especially the back of the arms, when cleansing and moisturizing. Dead skin cells can collect and clog the pores, resulting in bumps or pimples. Whether it is due to extreme hot temperatures or physical exertion with exercise, sweat is the body’s natural way to cool down. When we sweat, our skin pores open and create an environment for dirt, debris, and bacteria to invade. This can cause pimples to form and irritate any existing acne on arms. The highest amount of sebaceous glands is found on the arms, back and neck. These glands produce sebum, an oily matter that lubricates the skin and hair follicles. An excess of sebum can clog the skin pores with dead skin cells, forming pimples. Pimples can form as a result of the friction of skin against fabric or rubbing on your skin with your hand. Acne can also develop with the abrasion of tight clothing or a backpack strap against skin. So-called male hormones, androgens stimulate the sebaceous glands of the body to increase in size and production of sebum. This may be why more males develop pimples on arms. Estrogen is a female hormone that fluctuates in levels during the menstrual cycle. Using various forms of estrogen-controlling agents such as birth control pills can decrease or increase the outbreaks of pimples, depending on the woman. Our skin can react to certain allergen triggers such as body wash, laundry detergent, or fabric softeners. This may result in arm pimples. Now that we know how we get a pimple on arm, let’s learn more about acne on arms home remedies. There are many commercial products available to alleviate or remove acne breakouts on the body, including on the arms. Due to their harsh chemicals, they may or may not solve the issue, and some products can even worsen the condition. You might want to know how to get rid of arm pimples naturally. We have compiled a list of natural treatments for you to try at home to cure the pimples on your arms. By now, you have heard that exfoliating is an excellent tool in maintaining good skin health and appearance. You can exfoliate the dead skin cells and the oil collecting in the pores. Create your own exfoliating solution by mixing one tablespoon each of honey, sugar, and cornstarch with two tablespoons of plain yogurt. Gently massage the paste onto the pimples and leave on for a 10-minute treatment. Rinse with cold water, forcing the pores to close, and use an oil-free moisturizer. Sea salt could be a powerful eliminator of any excess oil that collects in the pores. Add one-half cup of sea salt to a basin of hot water and soak arm for 10 minutes. These three natural ingredients can moisturize, soften, and exfoliate the rough patches of the skin where pimples appear. Combine three tablespoons of ground oats with two tablespoons each of honey and salt. You may need to add some water to create a paste. Use gentle, circular massaging motions to apply on skin. Rinse after 15 minutes. Repeat this remedy three times each week. Remember that gooey clay we played with as children? It can give us pleasure as adults in clearing our skin issues. Add enough water to two to three tablespoons of green or pink clay powder to create a paste. Slather the clay on the affected areas of the arms for a few minutes before removing. Because the clay can absorb oil, use this remedy only twice throughout the week. It may remove too much oil and dry out your skin if used often. This natural plant remedy could be used to alleviate acne symptoms and bumps on the arms. Its active components, allantoin and rosmarinic acid, may repair skin tissue and combat inflammation. Put fresh comfrey leaves in boiling water to simmer for two minutes. Place the leaves on your arm twice each day. The plant calendula, also known as a marigold, is thought to have anti-inflammatory properties in its orange flower petals. This could help target the pimples. Use a double boiler to melt 150 grams of emulsifying wax. Add 70 grams of glycerin, 80 milliliters of water, and 30 grams of dried calendula petals. After simmering for three hours, strain with a muslin cloth and stir until paste is cooled. Apply to affected regions on arms twice each day. For a quick and easy solution to treating pimples, grab your favorite white toothpaste and apply to the pimples. Leave it to dry for 10 minutes before rinsing with warm water. Be sure to use only low-fluoride white toothpaste and avoid applying to extremely dry skin. Pimples on arms can be unsightly and cause a great deal of discomfort. The upper arms tend to be forgotten until the warm weather hits and we reach for our sleeveless tops and dresses. While acne is a common condition for millions of people throughout their lifetime, it is something you don’t want to leave alone as infection can set in with open wounds. We may not be able to control the internal causing factors such as hormonal; however, by knowing the cause behind the pimples, you may be able to prevent outbreaks. When acne on arms is present, there are home remedies to successfully treat the pimples. Dr. Mary, “Pimples On Arms – Causes, Treatment, Pictures,” Bye Bye Doctor; http://byebyedoctor.com/pimples-on-arms/, last accessed July 14, 2017. Surekha, “Pimples On Arms,” Diseases Pictures, December 1, 2012; http://diseasespictures.com/pimples-on-arms/, last accessed July 14, 2017. Ajmera, R., “Causes of Acne on the Arms & Back,” Livestrong, April 22, 2016; http://www.livestrong.com/article/84961-causes-acne-arms-back/, last accessed July 14, 2017. “How To Erase Pimples On Your Arms,” Step To Health; https://steptohealth.com/erase-pimples-on-your-arms/, last accessed July 14, 2017. Defeo, S., “Home Remedies for Acne on the Arms,” Livestrong, August 16, 2013; http://www.livestrong.com/article/167064-home-remedies-for-acne-on-the-arms/, last accessed July 14, 2017.